ICS offers our clients Watchdog, our State of the Art Managed Services Platform. Technology is always evolving but for many years the methods of servicing that technology did not keep pace. Service was reactive, fixing problems as they occur. This is not the case anymore. Now we have the tools to proactively manage, monitor and maintain networks of all sizes. Managed IT creates efficiency. Scheduled routine maintenance of networks is performed during off hours. As a result Servers and Workstation run faster and technicians no longer have to work on systems during business hours. The goal is to keep your network up and available to your users without interruption and detect small problems before they become large problems. Watchdog includes enterprise class network monitoring solution capable quickly detecting and resolving network outages and reductions in performance. Keeping a watchful eye on critical business systems not only allows us to quickly react to a system wide problem but gives us the ability to intercede when a small problem occurs, correcting it before it escalates and causes downtime. All alerts from your systems go to our Network Operations Center (NOC) 24 hours a day. We are alerted to the problems and can take action to correct the problem right away. ICS delivers a secure and comprehensive enterprise class patch management solution. Updates to Operating Systems are crucial to maintain the security of a network but often cause unforeseen problems. ICS tests updates before they are installed, withholding updates that do not perform or are unnecessary. Once suspect updates are corrected they are rolled out automatically. Watchdog provides the ability to quickly inventory servers and workstations, generating Patch Status reports for all machines. Watchdog includes Anti Virus for every machine on the network. Using the most effective solutions available, systems are scanned and updated each night. Any infections detected are quickly reported and removed. Constant monitoring of the Anti Virus software allows our technicians to ensure that the infection is removed. You will also never have to worry about renewing your Anti Virus agreement again! ICS complements its anti-virus solution with an equally encompassing anti-spyware facility. The two, when used in conjunction across your network, give you premier protection against all types of malware, ad-ware, and any of the new-generation ‘wares’ being concocted to give you and your system’s users annoyance and grief. Watchdog bundles remote access capability for your users. More flexible and reliable then most means of offsite connections, our system allows access to multiple workstations and servers, provided the user is permitted access. A simple login can allow connections to a PC’s desktop, working fluidly as if you are sitting in front of the machine. Our remote log-in eliminates the need for software configuration on the PC you use to remote in. 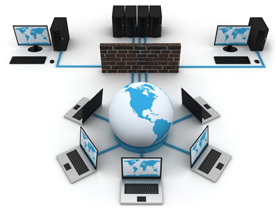 A simple and secure web gateway allows for access from any PC anywhere in the world. Watchdog keeps workstations running fast. Over the course of time a PC will slow down and impede a user’s ability to work. On a scheduled basis, Watchdog will clean-up a workstation, keeping it optimized to run as efficiently as possible. More importantly it all happens at night, allowing your users to work uninterrupted during business hours.